In the twelfth century the Manor of Sutton consisted of a central small town or village called Great Sutton and a number of scattered hamlets separated from each other by swathes of countryside. These hamlets were Maney, Walmley Ash, Little Sutton and Hill. The feudal Lord of the Manor of Sutton was the Earl of Warwick, but early in the twelfth century Hill and Little Sutton were both granted to the newly-founded Canwell Priory. The inhabitants of Hill therefore owed services to the Prior of Canwell in return for holding their lands and houses in addition to the duties due to the Earl of Warwick as Lord of the Manor. When William Walker took in two small fields from the commons at the north end of Hill Village he paid rent for them to the Lord of the Manor, as the Prior of Canwell had no claim to the commons. Early maps show the houses of Hill Village lying on either side of Hill Village Road, lending force to the suggestion that this was a tenth century planned settlement. There was enough land in the open fields of Hill to support about forty villeins whose house plots were laid out regularly on either side of the road to Lichfield, each villain having strips of land in the three open fields. Nine hundred years later, when the first detailed maps were made, this regular settlement pattern can still be seen, much altered over the centuries, some plots abandoned, some sub-divided. William Walker’s transaction is referred to in the Sutton Bailiff’s Account of 1480, where the fields are said to lie at the north end of the “town of Hill” beside the highway leading towards Lichfield, and there are later documentary references to Hill as a town, for example in a conveyance of 1724. So who were the townsfolk of Hill? The Hearth Tax records of 1663 list fifty-six households in Hill, but some of these would live in the outlying settlements of Four Oaks, Hill Hook and Ley Hill, leaving approximately forty in Hill proper. More than half of these were landless cottagers, securing a living from cottage industries such as nail-making (four forges are listed), labouring on farms or relying on poor relief from the Parish. Only ten or twelve were yeomen farmers like their medieval ancestors, with five or six fields in what used to be the open fields of the town, while there were several middling tradesmen, a publican, and two gentlemen. The Sutton Parish Register records the death of a schoolmaster at Hill in the 1680s, so there must have been a school for the many children of the town as well as the pub to give the people a sense of community. But whereas, centuries before, the working of the open fields demanded a great deal of co-operation and interdependence between neighbours in Hill, by 1663 they were all private individuals minding their own business. Their houses were standard three- or four-bay timber-framed buildings, none of them still standing today, except the more substantial stone house known as the Malt House which stands at the south end of Hill Town, and was once an inn called the Woolpack. 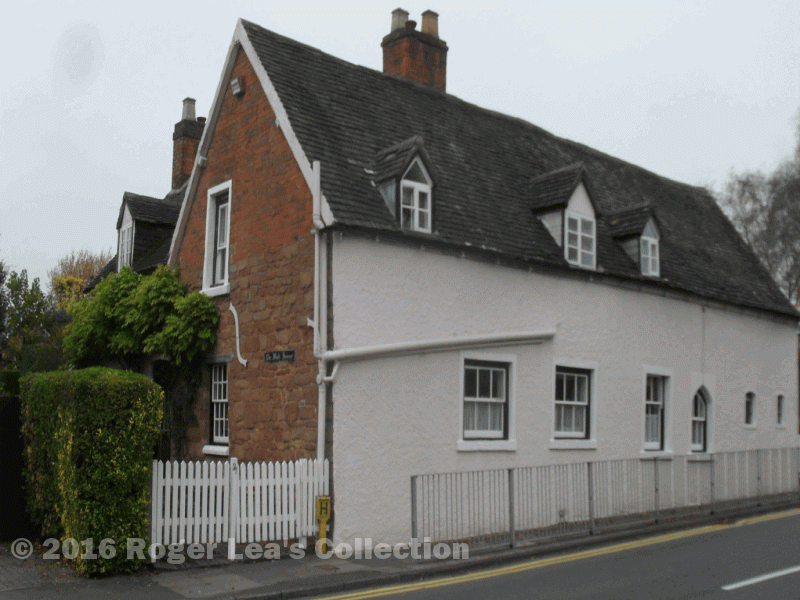 Seventeenth century travellers from Sutton to Lichfield would pass this house on entering the township of Hill. 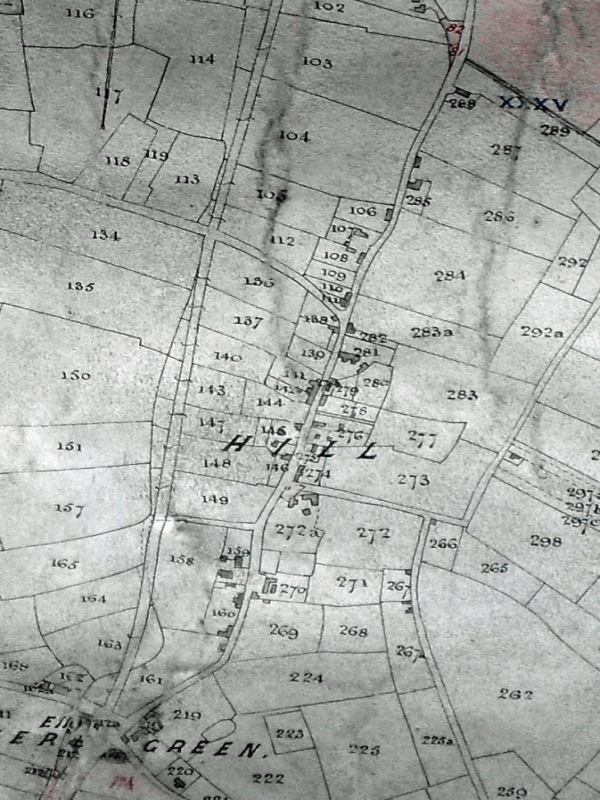 Detail of the 1824 Corn Rent map of Sutton, showing the remains of the regularly laid out plots on either side of Hill Village Road.